The "UFO", which is 1.1 meters long and weighs 10 kg, crossed the Huangpu River in a 45-minute flight to deliver a cake to a customer. 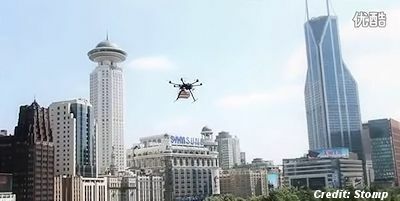 A small "unidentified flying object" that has been seen over Shanghai's Huangpu River in recent days has been revealed to be a remote controlled plane being used to deliver cakes, reported Shanghai-based news website eastday.com. The "UFO", which is 1.1 meters long and weighs 10 kg, crossed the Huangpu River in a 45-minute flight to deliver a cake to a customer, according to the bakery that was testing the device, which flies at a maximum height of 100 meters. While some residents applauded the novel delivery service, others worried about its safety as people could be hurt if it falls from the air. Currently there are no regulations on commercial use of remote controlled planes being used for deliveries. . . .